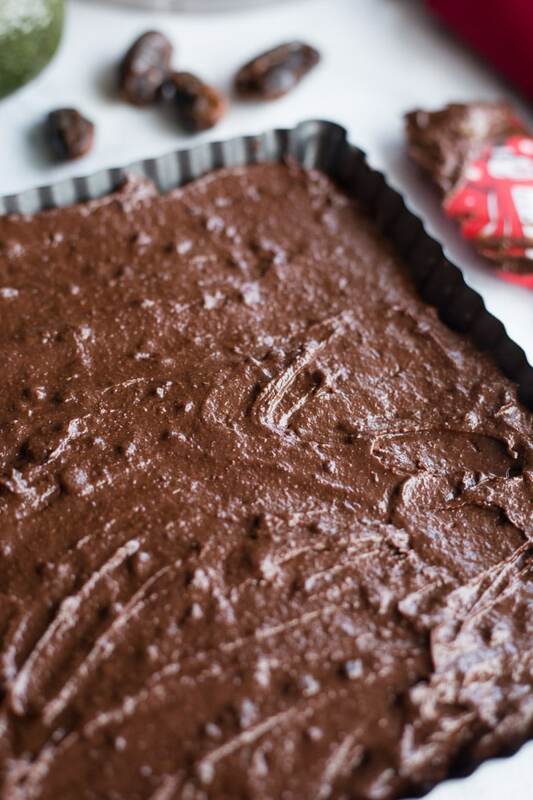 Christmas baking is about to get serious with these Peppermint Mocha Fudge Avocado Brownies! It’s less than a month until Christmas and I’m in complete holiday mode! Christmas shopping is in full swing, festive tunes are playing, and the house is fully decorated. Yup! We finished decorating over the weekend, so we’re good to go! Just waiting for Santa! Okay, that’s not true at all! I’m definitely not good to go. There is still a tonne of shopping, baking and wrapping that needs to get done between now and December 24th. But we got this! Four weeks is plenty of time! Right?!?! How are you doing with your holiday prep? Are you stressed or cool as a cucumber?!? If you’re planning to start your holiday baking soon, may I suggest you start with these Peppermint Mocha Fudge Avocado Brownies? 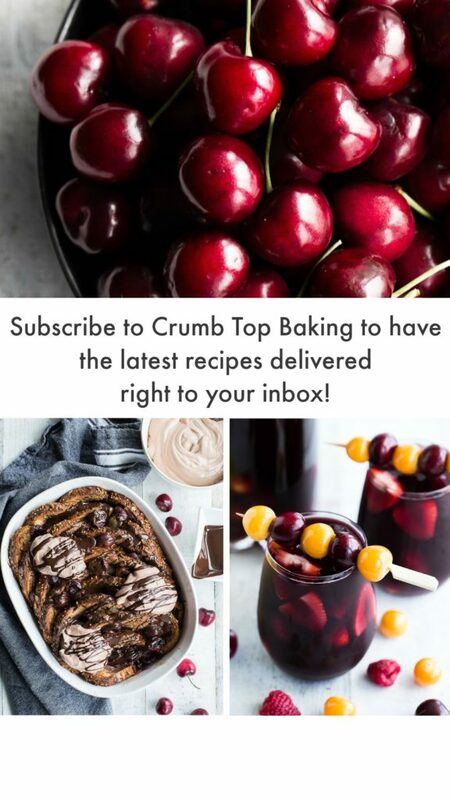 They are chocolatey and fudgy, just like a brownie, but packed with clean eating ingredients like avocado, dates, maple syrup and whole wheat flour. You may disagree, but when a brownie is clean eating (and fudgy…did I mention fudgy?!? ), it’s perfectly acceptable to eat more than one! Of course, sharing is also acceptable. One for you, and two for me 😉 . Speaking of sharing, these brownies would be perfect for a Christmas cookie exchange. A fudgy, healthier brownie that has a hint of peppermint, a decadent frosting and festive toppings! Now that’s a crowd pleaser, for sure! Can we talk about this frosting for a minute? 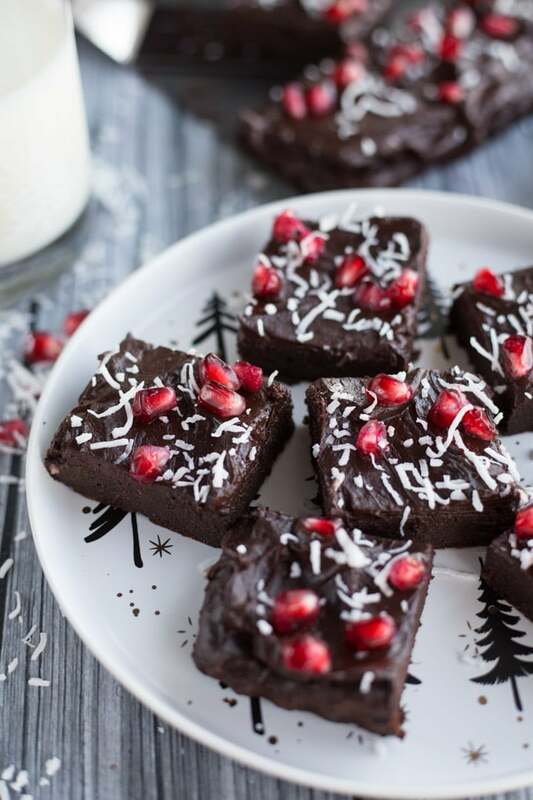 These Peppermint Mocha Fudge Avocado Brownies are not topped with a buttery, icing sugar frosting (although that would be pretty delicious too)! These are topped with an avocado frosting. It’s the same frosting I make for this dark chocolate zucchini cake, except I add some peppermint extract instead of chocolate almond milk. This frosting tastes so rich and decadent, you would never think it was made from avocado, cocoa and maple syrup! And, of course, I couldn’t leave these brownies hanging without a sprinkle of something! 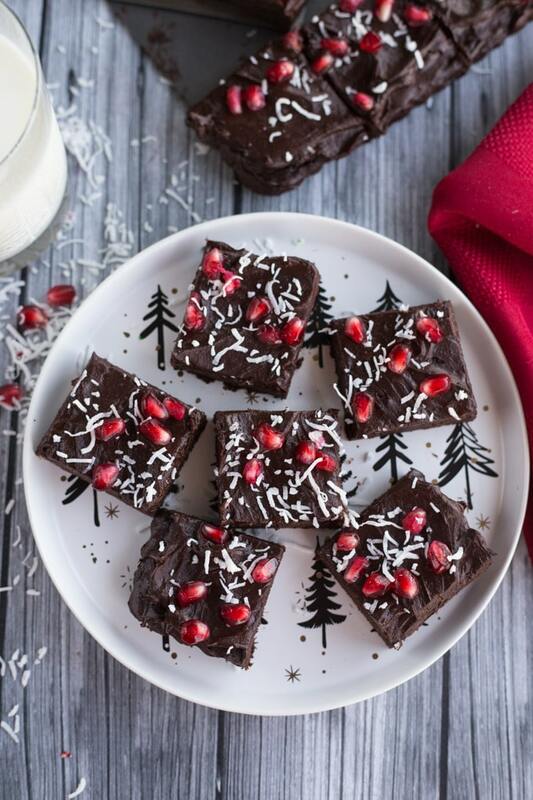 It’s the festive season, so I decided to top them with some unsweetened coconut and pomegranate arils. But you can add whatever toppings you have on hand. Mint chocolate chips, chopped nuts, or even red and green M&Ms would be delicious! As a side note, I wouldn’t top these Peppermint Mocha Fudge Avocado Brownies with crushed candy canes or peppermint candy. While it seemed like a festive idea, when I did that, the crushed candy dissolved into the avocado frosting. It really amped up the peppermint flavour, but it didn’t look that appealing. So avoid the crushed candy canes, or maybe serve the brownies with candy cane sprinkles on the side! Now that’s fancy 😉 ! And if you’re looking for more Christmas cookie inspiration, check out the Sweetest Season Cookie Exchange. It’s a week-long virtual cookie exchange running until December 2 and it involves a number of food bloggers, including me! We’re sharing brand new cookie recipes for the festive season. And it’s all in support of Cookies for Kids’ Cancer, which is an American based charity that is dedicated to funding research for new, innovative and less-toxic treatments for childhood cancer. If you’d like to join us in making a donation, you can visit the Sweetest Season Cookie Exchange fundraising page! Thanks! Happy baking and cookie exchanging! 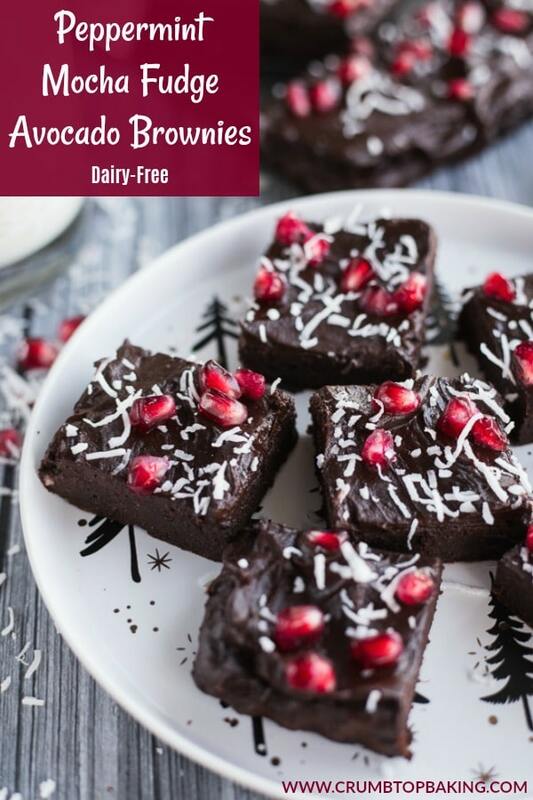 Christmas cookies are totally clean eating with these Peppermint Mocha Fudge Avocado Brownies. They are chocolatey and fudgy, just like a brownie, but made with clean ingredients like avocado, dates, maple syrup, coconut sugar, eggs, whole wheat flour and cocoa. And they’re topped with a decadent chocolate peppermint avocado frosting! So bring on the Christmas cookies! Pre-heat oven to 350 degrees and grease an 8″ tart pan with cooking spray. (You can also line an 8″ square pan with parchment paper). In a blender, add the dates and maple syrup and blend on high until the dates are chopped (about 30 seconds). Add the avocado and sugar, and blend until well combined (about 1 minute). Don’t worry if there are still chunks of dates in the mixture. Add in the eggs, coffee and peppermint extract, and blend on high for another 30 seconds. Next, add the flour, cocoa, baking powder and salt to the blender, and blend on high until the dry and wet ingredients are well combined. You may need to stop the blender a few times to scrape down the sides. Bake for 30 minutes, or until a toothpick inserted in the middle of the brownies comes out almost clean. (If it’s totally clean, the brownies may not be as fudgy). Let the brownies cool completely on a wire rack before frosting. Add the avocado, maple syrup and peppermint extract to a medium-sized bowl and beat with a handheld electric mixer on medium speed until the avocado is well blended (about a minute). On a low speed, gradually add in the cocoa, beating well after each addition. This will minimize the cocoa dust and ensure it’s well incorporated. After all the cocoa is added, beat on high until the frosting is creamy. This may take 1-2 minutes. Spread the icing on the cooled brownies and sprinkle with desired toppings. Serve immediately or keep refrigerated until ready to serve. The brownies will keep in an airtight container in the fridge for 2-3 days. 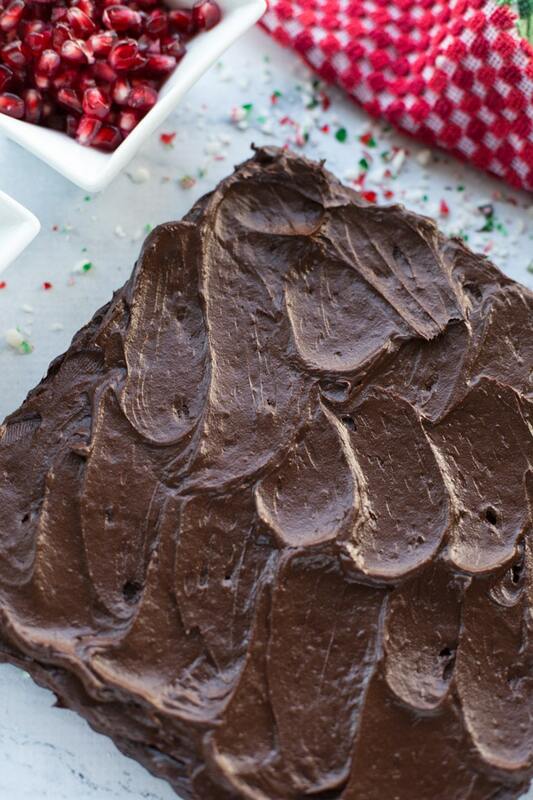 The first time I made these brownies, I added crushed candy canes to the top of the avocado frosting, which just seemed to dissolve into the frosting. So I would avoid adding crushed candy canes or peppermint candy as a topping. I’ve made these brownies using my Ninja blender and my food processor. While they both turned out well, I preferred the texture of the brownies made in the blender. It was also easier and quicker than using my food processor. You can make these brownies ahead of time and freeze them, but I would do this without the avocado frosting. When you’re ready to serve, just thaw and top with the frosting and other toppings. I’ve frozen these brownies with the frosting, and they seemed to freeze well. But it was only for a few days, so I’m not sure how long the avocado frosting would last in the freezer. I love avocado in brownies! Who would have thought, right?? I am not completely in the holiday mood yet because I feel like it’s coming a little too fast for me. I feel like I have way to much to do and not enough time. However, I’m sure it’ll all get done 🙂 These brownies look decadently delicious….how about two for me and one for you…not the other way around ;)….hehehe! I know! Avocado in brownies is amazing! Good thing I’m always stocked up on avocados! I have a feeling I’m going to be making these brownies a lot over the holidays! And I totally agree. The holidays are coming fast this year, but everything will get done! It always does! Clean eating brownies for the win Leanne! I’ve got to try these! Wonder if I can trick my husband with these?? I’ll let you know! You would have no idea how healthy these brownies are by looking at them!! They look so decadent! I love it! I will be making these for sure and not telling my husband what’s in them until after I see that look of love on his face! PS – I’m a huge procrastinator by nature and have not yet started my Christmas shopping. Time to get on it! It’s so funny that we have to trick our husbands into eating something healthy! I only told my husband what was in these brownies after he ate one! Hope you get a chance to make them! In the meantime, it’s not even December yet, so you still have lots of time for Christmas shopping ;)! I can’t believe these are so healthy! They look absolutely decadent. Thanks Jenna! They do look pretty decadent, don’t they?! I like having the option of a clean eating decadent treat at Christmas!! I’m in full Christmas stress mode already. I need some of these brownies to binge eat–they look so good I want to grab them right off the screen! Hope your week is going well, Leanne! Thanks Kelsie! I wish I could deliver some to you! On the bright side, you still have plenty of time to make these before Christmas ;)! Enjoy the rest of your week! That avocado frosting looks insane! Can’t wait to give these a try. Thanks Liz! It’s my favourite chocolate frosting these days! So easy to make, and butter free! Hope you like them! Now we’re talking!! I’m so ready for these, I have the christmas tree up and holiday music going, all I need is one of these brownies and I’ll be all set!! Love that frosting! Take care. Thanks Stacey! The tree, holiday music and these brownies sounds like an awesome plan!! I like the way you think ;)! I am with you! We are set and ready for the big day!! These brownies will only add to our fun! Delicious! Thanks Annie! I’m so happy we have our decorating finished! Now I can enjoy the December festivities. Hope you get a chance to make these brownies! 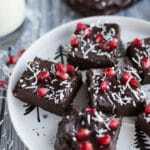 A healthier brownie for the holidays? HECK YES! I love chocolate and peppermint together in anything, so I’m fairly positive these are going to be a HUGE hit at my house. (And if they’re not a hit with the husband and the toddler, I’ll just eat them all myself, haha.) 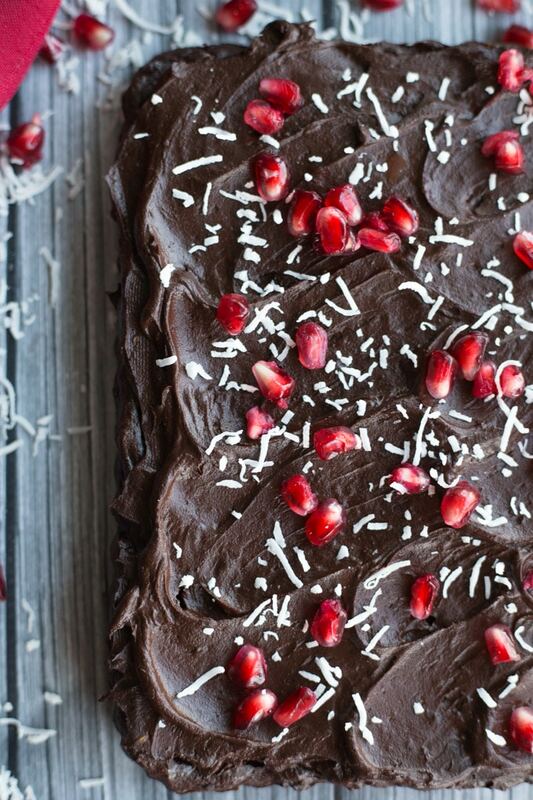 Also, I love the addition of the pomegranate–yum! Thanks Erin! I definitely wanted to have a healthier cookie option for the holidays, and these brownies turned out so well! Chocolatey and fudgy, my guests will never know they are clean eating! Hope you like them! I’ve baked with avocado in cakes before when making vegan chocolate cake, but I’ve never considered putting them in frosting. What a brilliant idea – I can totally see how they would help mimic that thick, buttery texture. Such a great brownie for a great cause! Thanks Julie! Avocado makes an awesome chocolate frosting! It’s super thick, and paired with cocoa and maple syrup, you can’t even taste the avocado! And I totally agree! The cookie exchange was for a great cause! Happy Holidays! Avocado? I love that idea! Thanks so much for sharing! Thanks Sheila! Avocado works really well in these brownies, especially in the frosting. It’s so good!